Today we harvested about 3/4 of our large red pears. They each weigh about 300g (12 oz) and we picked loads. Sadly, we don't know precisely what variety they are - but think they are a red comice sport. Red sports were first discovered in the 1900's in Oregon. A "sport" is a naturally occurring transformation that develops occasionally on fruit trees. It's shape really isn't very traditional pear shaped - more round with no real neck and it starts out as a dark, dark red. When the fruit is young, its nearly black in color, but it does go lighter as it grows and then ripens. As with all pears, it is best not to let them ripen on the tree, as if left on the tree, they ripen from the inside out for the center is mushy by the time the outside flesh is ready. So these pears have gone into our "fruit" fridge in the garage. 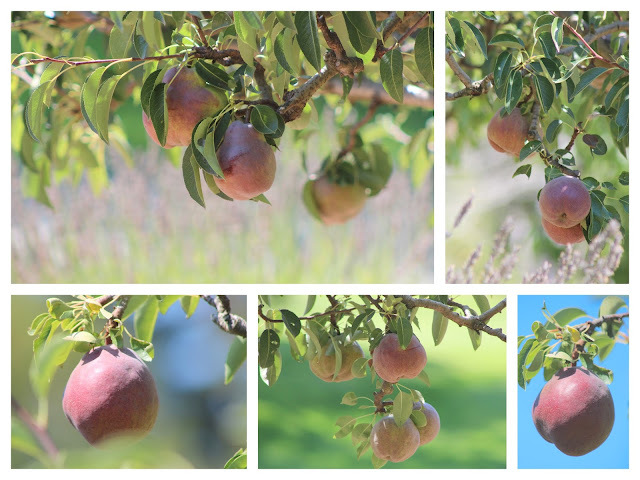 To tell if a pear is mature enough to pick, the rule of thumb is that, while still on the tree, if you lift the pear to a horizontal position from the usual vertical hanging position, the stem will detach if it is ready, but won't if it needs longer. (This does not apply to Bosc pears however, which are difficult to detach from the tree, ripen or unripe). Once picked, pears need to be cooled. Some varieties need only a day or two in the fridge (Bartlett), but others (Anjou, Bosc, Comice) need 2 - 6 weeks for optimal ripening. Without this chilling, picked pears will just sit and sit and eventually decompose without ripening. What ever variety ours are, they need a few weeks to ripen. After their chill, the pears need to be at room temperature for 4 - 7 days, depending on the variety to complete their ripening. The longer they've spent chilled, the less time they need at room temperature. By the time our family arrive in a month, these should all be perfect! Let's hope they like pears :-D These are the juiciest, tastiest pears! We still have to pick our other pear tree...maybe we can wait a couple of days for that. Pears anyone?